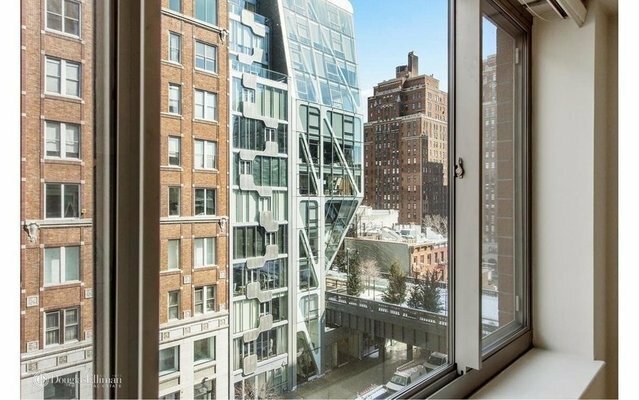 Showings Begin May 1st - The perfect High Line 2 bedroom! This well-designed, split 2 bedroom, 2 bathroom home provides a bright living space in the heart of West Chelsea's gallery district. The living room windows offer views of the High Line and benefit from an open North exposure across 23rd Street. The kitchen features solid wood cabinetry, granite countertops, a breakfast bar, and stainless steel appliances including dishwasher and full sized refrigerator. With great storage and an open pass-through to the living room the kitchen lends itself well to entertaining. The apartment has hardwood floors, a stacked washer and dryer, generous closet space, and ensuite master bathroom. The Marais is a full service luxury elevator building that includes full time doorman, available bike storage, laundry room, garden, and a large rooftop deck with beautiful views of Manhattan. Conveniently located across the street from an entrance to the High Line, two blocks to Chelsea Piers, two blocks to the C, E trains, and steps to the Hudson River Park, Meat Packing District, Chelsea Market, and some of the city's best dining, shopping, and art galleries.